Update 29.4.18: The full Spokes 25-page submission [5MB pdf] and tweet. Whilst supporting the principle of the tram, Spokes is very concerned that the lessons of the original system have not been learned – and the original tram layout has resulted so far in around 250 people presenting at hospital A&E and around 150 people involved in legal action, due to bike/tramline crashes. The Council needs to design a transport corridor catering for all sustainable modes, and to create places where it is great to shop, sit, chat, walk, cycle – rather than first designing a tram layout and then attempting to fit everything else around that. This was a major flaw in the first tramline system and the plans on display do not appear to have learned the lesson. We are, however, heartened that the designers now state – forcefully and repeatedly – that all design options are on the table (other than changing the actual route, which is laid down in the tram legislation). 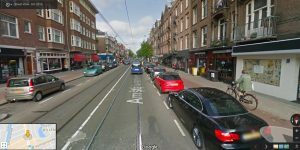 Tram stops could be re-designed or even moved, overhead poles need not occupy a wide central space, traffic restrictions are possible – and so on. Spokes will be providing a detailed response to the consultation, but the plans are extensive and we won’t get this finished till near the end of the consultation. We have therefore submitted this preliminary document which highlights major concerns. The proposed doubling of traffic lanes from 2 to 4 from Pilrig Street to the Foot of the Walk – resulting in an intolerable squeezing of cycling and walking infrastructure. In particular, rather than continuing the new Leith Walk segregated cycle lanes to the Foot of the Walk, there will be onroad lanes with parking and loading bays painted in them. This is not just unpleasant but a real and present danger – cyclists passing parked vehicles will have to pass close by the tramlines and will be forced into them if parked vehicles move out inadvertently. This issue is covered in more detail in our recent SpokesWorker 28.3.19 internal newsletter. It is interesting to note that while Edinburgh Council proposes doubling traffic lanes from 2 to 4 in Leith Walk, Glasgow Council is currently cutting traffic lanes from 4 to 2 in Sauchiehall Street. The proposed continuous kerbed median strip from Picardy Place to Foot of the Walk occupies valuable road width, will be paved with ‘pedestrian deterrent’ blockwork deliberately aimed to make it hard to cross Leith Walk, and makes it impossible for cyclists to cross from one side of the road to the other except at the few traffic-light junctions. The location and design of some tram stops is much less bike-friendly than need be (for example Constitution Street). At various stops use of non-central platforms and/or staggered platforms in narrower streets, as is common in European systems, would allow more road width for segregated cycle provision. There is no cycle provision proposed (apart from red Advance Stop Zones) along Constitution Street and Ocean Drive. A separate point, not covered in our initial submission, concerns the construction period during which the northern section of Leith Walk will be closed, except for one southbound traffic lane, for 18 months. At present there are no plans for any cycle provision for this one and a half year period. A 2-way temporary cycle facility in Leith Walk is essential, and should surely be possible. The St James developers have managed it in Leith Street during the lengthy closure there – are the tram developers going to fall behind that example? Ask your councillors to support your views – find councillors at www.edinburgh.gov.uk/councillors. If you feel particularly strongly, ask to meet one or two of them at their surgery to discuss. If you have detailed comments about any section of the tramline extension that you would like considered to be included in the Spokes response, please email Spokes as soon as possible. And, most important, put your ideas in your own response to the consultation.